Are you all enjoying the weather or still idling in the pod ? I tell you a walk in the morning in this mellow weather do a lot of good to you , and you feel so energized for the rest of the day . Don't you think so ? Any one doing that yet ? The mushrooms are usually viewed as a substitute for meat ,but they two go along so well, once you get a taste of it you would very well know how beautiful they complement each other . Chopped Parsley or any other herb of your choice - a handful . Heat 1 spoon oil in a pan and add ground meat , saute well , breaking the lumps with back of spoon . Add salt to taste and saute till its no longer pink. Add chopped ginger , garlic , cinnamon and soy sauce and saute for another couple of minutes. Add water or chicken stock and cook it covered for 20-25 minutes , or until it is cooked( add more water if needed) . Uncover the pan and simmer for a couple of minutes until it is dry. Set aside. Heat one spoon of oil in another pan and add chopped finely onions and saute for 6-7 minutes and add chopped garlic. Saute till it starts to brown. Meanwhile lightly crush cardamom , cloves , star anise , and black pepper in a mortar and pestle or coffee grinder and add to the pan . Toss it well. Add red chili powder , coriander powder and juice of lemon(if using) and fry for a minute or so . Add chopped mushrooms saute for a couple of minutes and add prepared meat mixture, parsley and simmering saute for some time , till it is mixed with all the masala , mushrooms are cooked and it is done and dry . Takes like 7-8 minutes . 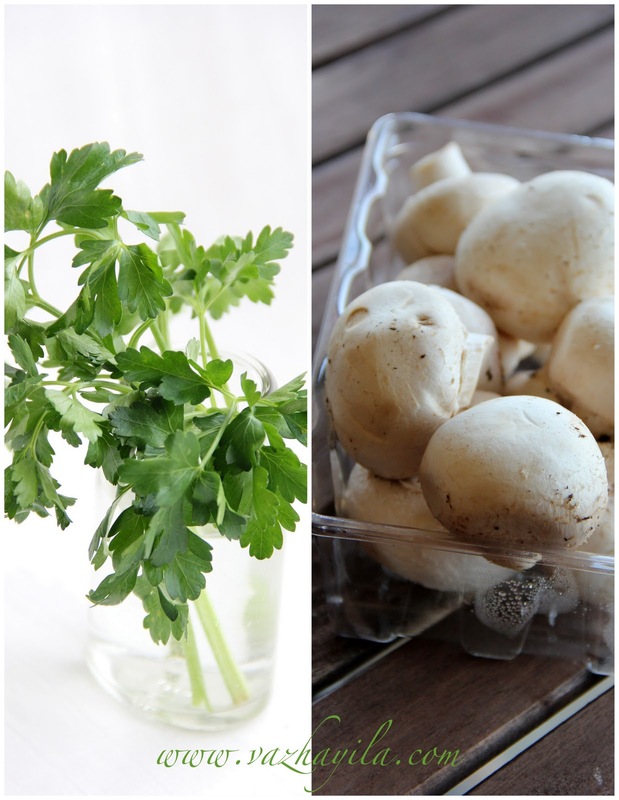 I have used parsley in the recipe , since i love the smell of parsley , you can use any herb of your choice. the rolls look awesome!....the curry looks delicious!...the whole set up is too good! love it! wow wow wow....soooooo tempting....Loved the rolls.... too good!!!!!!!!!!! as always, pics are amaazzzzzzzzziiiiiiing!!! Ahh Sarah, the pictures are mind-blowing!! But, that's nothing new elle..? You rock, girl!! woww very tempting..perfect combo dear!! 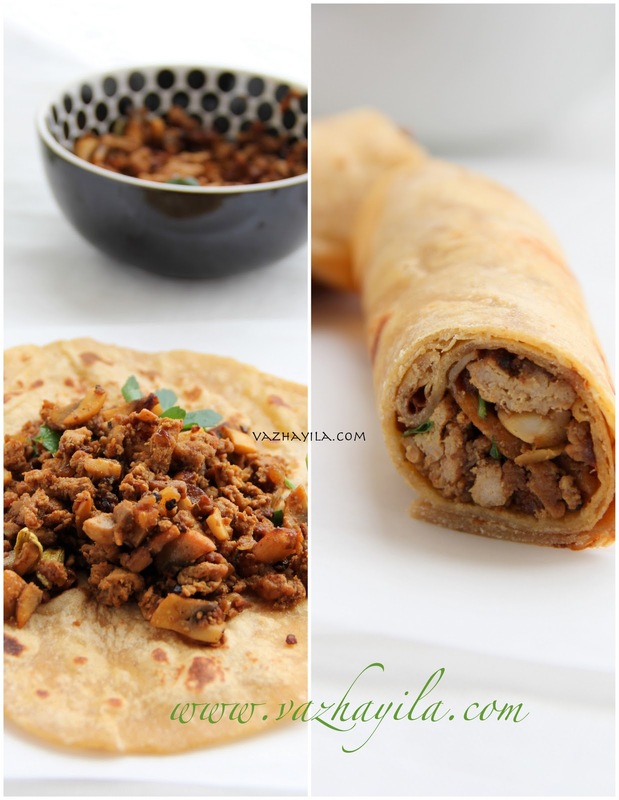 Wrap looks so beautiful and sounds so yummy...Love the combo of chicken and mushroom keema...truly delicious recipe..Thanks for sharing,Sarah! Rolls looks superb !! So delicious combo !! Excellent clicks !! scrambled chicken mushroom kheema adipoli. Great combo- The pics are FANTASTIC. Perfect wrap for a snack and even for lunch! Wow...super pics and recipe...makes me drool..
wow...wonderful presentation and beautiful clicks...recipe looks super delicious ! I love the morning walk and breath the fresh air. Mushroom and chick are unusual combo, looks great for wrap! Excellent photography! I love the wrap. Breathtaking Stills,..Would love to share a few wraps from u..
Can't stop drooling over the pics, truly irresitible..
Love this combo,wrap is simply mouthwatering. wow...chick n mushroom vs a good combo sarah...it would be a good evening snacks to kids na....as well as a good breakfast too...loved it..
Can we do this with beef or pork? Looks so delicious and wraps are perfect for any occasion..
Nice combo !! Perfect ones for the trips. Awesome clicks !! Kheema roll looks so comforting. Your chicken kheema looks wonderful! I love how you turned it into a wrap! We used to go camping in the Poconos - such a pretty place. Oh i'm still idling in the pod, since spring is yet to reach us, but i'm SO much looking fwd for it! chicken and mushroom fry sounds fantastic idea wraps are brilliant!